Yesterday I mused whether certain bestsellers will (or did) become classics. See my previous post here. 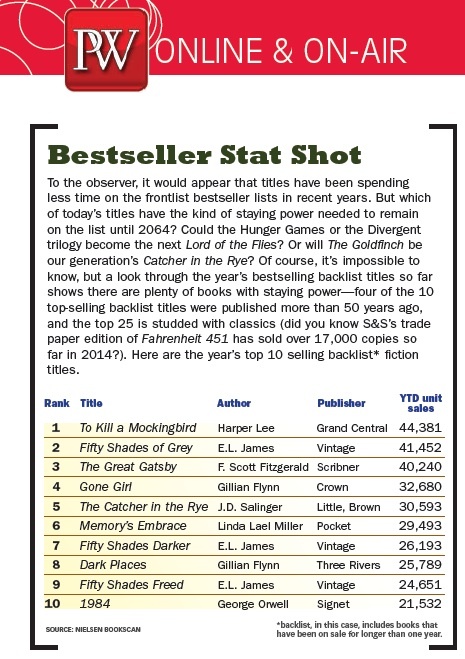 I recently came across the list above in the Feb 24, 2014 edition of Publisher’s Weekly. It reveals the year’s top selling backlist fiction titles, which includes books that have been on sale for longer than one year. Four of the titles are easily recognizable classics, and the authors are all dead: Lee, Fitzgerald, Salinger, and Orwell. Of the others, three of the ten are the Fifty Shades of Grey trilogy. Flynn writes thrillers, while Miller is romance. I’m guessing that the demand for the classic titles is generated by high school and college students, whereas the contemporary titles suggest escapism reading by other adult readers. The score is 6-to-4 with the non-classics winning, which is depressing. However, there’s hope when To Kill a Mockingbird beats Fifty Shades of Grey!